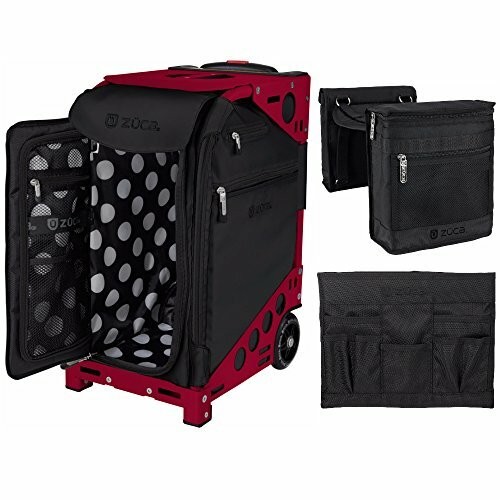 The Zuca Oxford stands out from other Zuca bags with its fun and cool polka-dotted interior lining, but it’s still serious on providing you with the exceptional storage capacity, portability and convenience that you know and love from Zuca. Strict limitations are in place by the FAA for what may or may not be used as carry-on luggage on flights. You can rest easy knowing the Zuca Pro meets those requirements and is fully FAA compliant. These wheels also have a cool flashing design with embedded LEDs. They look great and will keep you safe when wheeling your bag at night. Insert Bag with 5 Packing Pouches: 4 Large Utility Pouches – 2.5" x 7.75" x 11" & 1 Small Utility Pouch – 2.75" x 6.75" x 11"
Unit Dimensions (HxWxD) - 19.5" x 10" x 13.5"